Last week, we lost a friend, an inspiration, a legend and a leader. Mike Hall died in a collision with a car during the Indian Pacific Wheel Race near Canberra, Australia on 31st March, 2017. Mike was one of the best self-supported, ultra-distance cyclists in the world and inspired so many people due to his own abilities and the races he organized. Of course, there is not only the cycling community that has lost someone truly special, Mike also has very loving family and friends that he has sadly left with a gap in their hearts. I cannot begin to understand how they are coping with their loss, and my sincerest condolences go out to them. Mike won every race that he entered between 2012 and 2016, including the World Cycle Race, Tour Divide (twice), and the Trans Am Bike Race, setting record-breaking times in each of them. See details on his Wikipedia page. 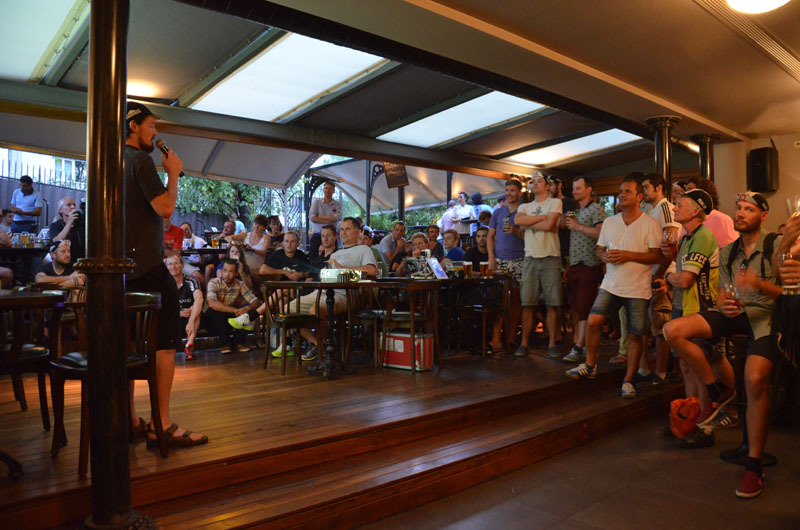 Mike entered the 2017 Indy Pac race across Australia along with the strongest field to ever compete in a bikepacking race. Some physical problems initially prevented Mike from closing the gap to the 1st-place rider, who was the 3-time TCR winner Kristof Allegaert. On the 12th day of the race, Mike caught and passed his adversary for a while, but he fell back to 2nd before tragedy struck about 400 km from the finish line. No-one else has won races and set records in both on-road and off-road events like Mike Hall, and he’s also won the longest bike race on Earth. His racing achievements may never be matched. After doing the World Cycle Race in 2012, Mike decided that this style of racing could become popular if it was designed to fit into people’s vacation time. 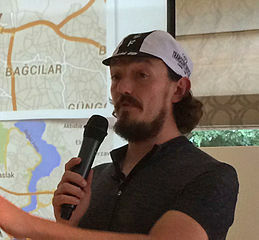 The first leg of Mike’s global trip went from London to Turkey and because he saw how impressive the cultural and geographic changes were in that relatively short distance, he decided to create a self-supported bike race across Europe from London to Istanbul and visiting a couple of significant places in bike racing history along the way. The Transcontinental Race (TCR) had been born. His idea worked. After 30 people started the first edition in 2013, word spread and the 101 starting places for the second edition were filled within a week. For the third edition in 2015, 350 applications were received for the 250 starting places, and the number of applications went up to over 1000 by the next year. There have been numerous films and extensive media coverage of the race throughout Europe and around the world. The TCR wasn’t the first-ever bikepacking race of this type of length or format. The Great Divide Race, a mountain bike race down the Rocky Mountains, was first held in 2004 and then superseded by the longer Tour Divide (see the Wikipedia article). However, the TCR went into new territory in terms of organization and trying to make a wider audience aware of the event. People saw the level of interest in the TCR and decided to create similar races on roads all around the world. The Trans Am Bike Race in the USA started in 2014 (although that was also heavily influenced by the Tour Divide), the TransAfrika in South Africa started in 2015, the TransAtlanticWay race in Ireland started in 2016, and the Indian Pacific Wheel Race in Australia started in 2017. Other races that are planned but that haven’t yet begun include the 2017 North Cape 4000 from Italy to Norway and the 2018 Baa Baa Bikepack around the UK. See the page about Other Ultra-Distance Races for links. These races probably wouldn’t have been launched, or it would have taken much longer for that to happen, if Mike hadn’t lead the way by organizing the first TCR back in 2013, so no-one will ever come close to the level of influence that Mike has had on organizing this style of racing. Mike has not only influenced the people who’ve done these events, but also the many thousands more who have read about these people’s efforts and followed the races online. Reading the heart-felt dedications that have been posted about him in the past few days, there are so many examples of people who have been inspired to get out and ride a bike and push their limits a bit more. Many people have reported this leading to them having a more active, healthier lifestyle, and hopefully some of them now leave their cars at home on some days – making the roads safer and the planet healthier for everyone. Personally, before I watched the first edition of the TCR in 2013 and participated the next year, I was just someone who went bike touring and did some mountainous cyclosportives (see About Me). I had no idea that I would become absolutely obsessed with this type of bike racing or that I would start an Unofficial TCR Advice website in late 2015 that would turn into Ride Far and now be attracting 5,000+ different visitors per month in early 2017! None of this would have happened without Mike – he certainly changed my life. I’m pleased that this website is continuing to pass on his influence to encourage even more people to Ride Far. When I asked Mike about starting this website, one of his reservations was that it would make doing the TCR too easy and so he might have to respond by increasing the difficulty or length of the route. He always wanted to encourage people to find their limits; he had equal respect for the people at the back of the field who are pushing themselves just as hard as the fast ones at the front. During each TCR, Mike was always incredibly busy, but found time to talk to everyone that he could. An entertaining memory that I have of him was at the party after TCR 2014 when he showed me and a few others his method of screaming/roaring at dogs so that they back down instead of chasing him – it certainly terrified us. The proudest moment of my very limited ‘racing career’ was when I finished in the top 30 of the 2016 TCR in Çanakkale, Turkey and Mike came up to me and said “Strong ride, Chris” – that meant a massive amount coming from him. I had pushed myself as hard as I could, and Mike recognized that. The only way that I can think of to help avoid future tragedies is to keep encouraging people to ride their bikes more and leave their cars at home. The more cyclists there are on the roads and the fewer cars, the safer and healthier everyone will be (a lot of cross-cultural research provides solid evidence for this). So don’t use your bike only for fitness and leisure, please also use it for transport. The topic of how the community, the Transcontinental Race, and bikepacking races in general will move forward following this tragedy is a massive one that I will leave for another day. For the moment, I simply want to remember Mike and be sure that everyone appreciates his incredible talent and his amazing influence on the world. Thanks for everything, Mike. You will always be my hero and my friend. Wonderful tribute to Mike, thank you, Chris. I cannot imagine your loss, but I am just thankful that Mike was with us for the time that he was, and he certainly made the most he could out of that time. Stay strong, Pat, and remember that you’re amazing too, and thanks for everything that you’ve done for the crazy little community that Mike helped to build.